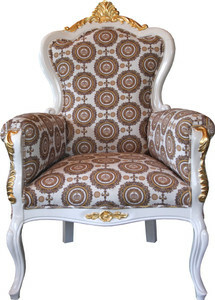 Product information fpr "Pompöös by Casa Padrino Luxury Baroque Armchair Bergere Beige / white / gold - Pompöös Baroque armchair designed by Harald Glööckler"
This baroque armchair from the Pompöös by Casa Padrino collection by Harald Glööckler transforms every room into a true palace. 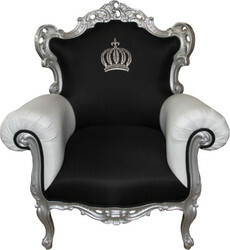 The magnificent luxury baroque armchair is an absolute eye-catcher. Casa Padrino presents the Baroque luxury armchair from the Pompöös collection by Harald Glööckler, the "Prince of Pompöös". Cozy yet regal, this Baroque armchair is a great choice for those looking for the perfect combination of comfort and style. Our armchairs from the Pompöös by Casa Padrino collection by Harald Glööckler are available in different designs and color combinations, so you can find here a model that fits your needs. Velvety soft and elaborately crafted, a Harald Glööckler designer armchair is a great choice for your living room or waiting area. Let yourself be enchanted by this beautiful Baroque-style armchair and transform your home into your personal oasis of well-being, with a fairytale and noble atmosphere. Bring your own personal Neuschwanstein Castle to your home and reside and revel in pure luxury like King Ludwig II. Technical data for "Pompöös by Casa Padrino Luxury Baroque Armchair Bergere Beige / white / gold - Pompöös Baroque armchair designed by Harald Glööckler"
Rating for "Pompöös by Casa Padrino Luxury Baroque Armchair Bergere Beige / white / gold - Pompöös Baroque armchair designed by Harald Glööckler"
Receive trends, offers and vouchers via e-mail! Unsubscribe at any time. I have read the Privacy police. I agree that my details and data will be collected and stored electronically in order to respond to my enquiry..